The multimillionaire is facing Republican incumbent Brian Fitzpatrick in the race for Pa.’s 1st District. Sep. 14, 2018, 8:30 a.m.
Scott Wallace’s family foundation has caused quite a few headaches for the multimillionaire, who is running for U.S. Congress in Pennsylvania’s 1st District. The GOP and conservative media outlets have used grants made by the Wallace Global Fund, which the candidate led for more than a decade, to paint the Democrat as anti-Israel and anti-police. Wallace will face Republican incumbent Brian Fitzpatrick in a recently redrawn district that includes Bucks County and left-leaning Philly suburbs. A number of stories published this summer by right-leaning outlets focused on grants the foundation made to so-called population control groups. Now, a particularly incendiary claim has made its way into a TV ad created by the National Republican Congressional Committee. Does Wallace, who has three children, actually advocate for a multi-child tax? We decided to fact-check the claim. When contacted for comment, NRCC Regional Press Secretary Chris Martin cited a Fox News article from July that reported on the Wallace Global Fund’s donations to groups that advocate limiting population growth. According to Wallace’s spokesperson, Zoe Wilson-Meyer, the candidate inherited the foundation from his parents in late 2003, after the donations were made. While the foundation’s 990 tax form for that year lists Wallace as “president,” internal meeting minutes show he was elected to that position in December 2013, according to Wallace Global Fund Executive Director Ellen Dorsey. Regardless of when Wallace took over his family’s foundation, it’s clear that he supports the aims of groups that seek to stabilize population growth through voluntary family planning. His father, the late Robert B. Wallace, was co-chairman of Population Action International, which advocates for increased access to birth control and other family planning methods. Under Wallace’s leadership, the foundation gave grants to Population Action International as well as the Population Council and Worldwatch Institute. The grants were earmarked for purposes including eradicating female genital mutilation, “research on population and the environment,” and “global reproductive health and rights,” according to the foundation’s Form 990 tax documents. The NRCC’s Martin also pointed to an endorsement for Wallace by the Population Connection Action Fund, the political arm of the group that produced the 1968 brochure. Dixon reiterated that statement when contacted by PolitiFact Pennsylvania, adding that he has never seen the 1968 brochure. Wallace’s campaign spokesperson said he does not personally advocate for a multi-child tax, and PolitiFact Pennsylvania was unable to locate any public records to contradict that statement. 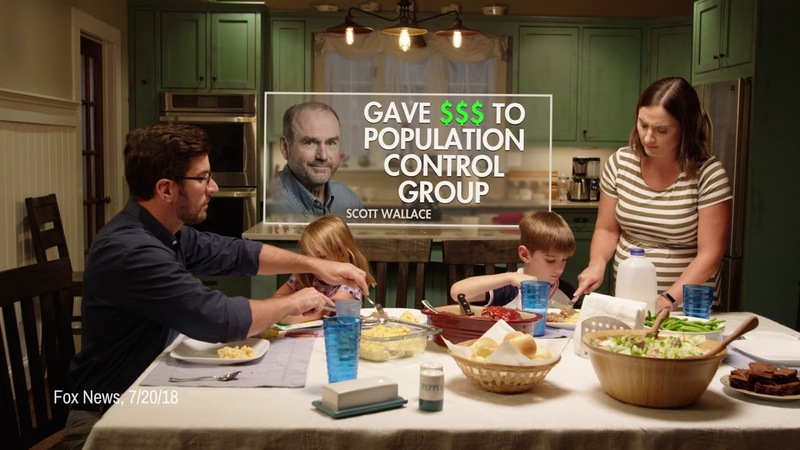 When Scott Wallace held the reins, the candidate’s family foundation awarded grants to nonprofits that advocate for family planning in order to limit population growth worldwide. An NRCC ad attempts to link Wallace to statements made in a 50-year-old brochure produced by a group his family foundation gave money to between 1997 and 2003. But Wallace has never personally called for the taxation of people with more than two children or accused them of “irresponsible breeding.” We rate this claim False.